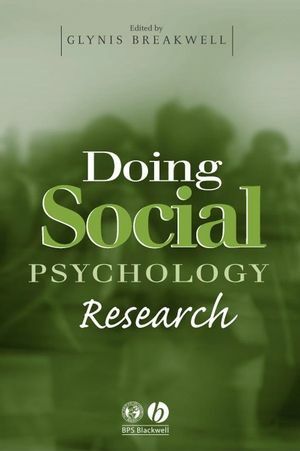 This practical text introduces students to all the principal data collection methods and data analyses used in social psychology. A student-friendly introduction to the data collection methods and data analyses used in social psychology. Describes the principal research methods and shows how they can be applied to particular research questions. Each chapter is written by a psychologist well known for using the method they describe. Methods presented include conducting surveys, constructing questionnaires, facilitating focus groups, running interviews, and using archival recordings. Topics used to illustrate these methods include identity processes, attribution, stereotyping, attitude change, social influence, communication, and group dynamics. Includes step-by-step exercises for students and notes for course leaders. Glynis M. Breakwell is Vice-Chancellor of the University of Bath. She is a social psychologist specializing in research and identity processes, risk communication, and military cultures. Her previous publications include Coping with Threatened Identities (1986), Interviewing (1990) and Research Methods in Psychology (with Sean Hammond and Chris Fife-Shaw, 1999). 3. Measuring Optimistic Bias. (Chris Fife-Schaw And Julie Barnett). 4. A Quasi-Experimental Study Of Stereotyping. (Adam Rutland). 5. The Design And Analysis Of Quasi-Experimental Field Research. (Eamonn Ferguson And Peter Bibby). 6. The Impact Of Social Value Orientation On Decision-Making In Social Dilemmas: A Survey Exercise. (Mark Van Vugt And Richard H. Gramzow).